There is an elephant in the room in nursing and it is not being addressed. In fact, I asked nurses on social media, and it turns out- there is not just one elephant. There are several! 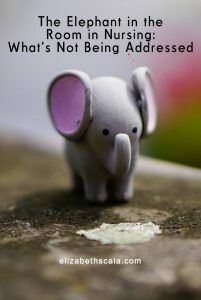 “Nurses, what “elephant in the room” needs to be addressed in nursing?” Oh boy! I did not know what I was in for! Nurses spoke up. They spoke out. Men and women alike commented, shared, and then commented on each other’s comments that were already there. The topic touched a nerve. Nurses spoke their truth. Shared vulnerable and honest emotion. I couldn’t let you down! These elephants need to be addressed in nursing. And they need to be addressed now! While these nurses did comment via their profiles on social media, I will tell you for the purposes of this blog post, I choose to keep names out of my synthesis. What you will read below is stated at times word-for-word by a nurse. However, I will not share the person’s name in order to protect their privacy here on this blog. I hope you enjoy reading. 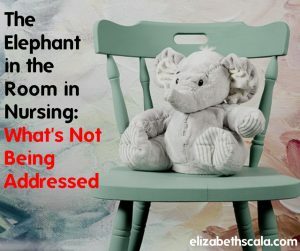 And hey, if you have an elephant in the room that needs to be addressed in nursing… leave your comment below. I would love to hear from more of you! Together we can unite and make our voices heard. Oh, one more thing before I get into our “elephants”. Some of the comments were repeated more than once. In fact, I tallied them up and will share that data with you below. While other comments were placed that I just could not fit into one particular category. Some of those unique nursing statements will be shared standalone. Oh boy. Opened a can of worms on this one. In fact, this was THE number one elephant in the room in nursing. Whether it was a comment about short staffing, unsafe staffing, staffing ratios, mandated overtime, task allocation, or the demands at work… you name it, you said it. There were over a dozen comments and an additional side bar conversation that went on way farther than this blog has room to go into… staffing was THE main concern. It is obvious to me. Nurses are not happy with staffing. Two comments stood out to me and I would like to share these, with a solution-oriented strategy for each. This is something I teach in the Burnout Proof Live training. It comes from the conditioning we receive as nurses. It starts as early on as nursing school and continues on throughout our career. We learn at a very young age, right from the start, to never show weakness. That we do not need help and when someone asks us how we are doing, we are to respond “I’m fine” as good nurses do. This has to stop. Here and now. With you and with me. If someone asks you how you are doing at work and if you really need help- tell them! If someone says, “Is there anything I can do for you” actually give them something to do that can help you. Nurses want to help. We help our patients and their families all day. Why not lend a hand and help each other!? Another comment made about staffing and the amount of work that we do. Now, I have got to tell you. I was at work the other day and this person was coughing and sneezing. And looked plain terrible. Go home! Stop making everyone else around you sick and do not come to work. I realize, at times, when we call out of work we receive disciplinary action for this. First off- that is not the case in every single instance. Let’s refrain from the “all or nothing” talk here, shall we? But if this IS the case where you work, have you ever asked anyone about this? Has anyone ever made an appointment with human resources, nursing leadership, or even your own nurse manager to talk this through? One of the problems the profession of nursing has is that we keep on doing what we’ve always done. We say, “Well, that is the way it has always been around here” and we do nothing to fix it. Take action, people! If something does not appear to be working. When something is broken- be the person to DO something about it. We spent a lot of time on the above related to staffing. I did this because SO many people commented on this as the main issue in nursing. Additionally, many of the other comments were indirectly related to staffing. Such as short staffing leads to burnout. Or staffing issues is why there is bullying. Finally, a few nurses pointed out that nursing leadership, having a voice in nursing, being on boards, and joining the political world to impact policy are ways to impact staffing. So what else? What are some of the other elephants that need to be addressed? Nurse burnout received about half a dozen responses. Bullying as well, about half a dozen votes. Others stated concerns related to the shift in focus- from a caring to a business model. Leadership, empowerment, public policy, and training/education all were voiced as concerns. The medical model itself was brought to light- with nurses pointing out that healthcare is more about sick care and less about empowering patients to find their ideal states of well-being. Before I wrap things up and ask you what you believe to be the elephants in the room in nursing that need to be addressed… I thought it would be fun to share some of the quotes that stood out on social media. My all time favorite comment that came from a nurse over on Facebook was about the real underlying issue here. As nurses, we often do a very good job at pointing out the problems. Why? It is part of our training and education. Think about it- Assess, Diagnose, Plan, Implement, Evaluate. What has happened here? We have become expert in the assessment phase. It is where we spend most of our time. We often do not have time to plan. Nurses may not have resources to implement. And evaluate, forget about it! We are back to our next patient assessment! Instead of simply pointing our problems and talking about difficulties, I urge each and every one of us today to choose something different. When we see an issue or come across a problem, we need to speak up. We need to take action. We need to become part of the solution. Thanks for reading and share your thoughts below! Great discussion question, Elizabeth! 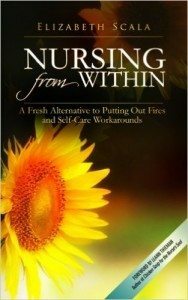 I would like to address one comment in particular: “The absence of a string and visible nurse leader to address the deteriorating health of Americans.” I completely understand what this person is saying and hence why I broke out of the norm and created, The Nature Nurse http://www.thenaturenurse.com . We need more nurses on the front line of preventive health and wellness. I am seeing more opportunities for this ie: nurse coaching (a certification available from the American Holistic Nursing Association). However, when we can’t find the job we know should be out there, we may need to step up and create it. Great point, Susan! Thanks so much for taking the time to share these insights with us. We as nurses can totally choose to take action and use our knowledge to its highest power. Thanks for stopping by. I agree. I have always heard that having a higher degree doesn’t make a difference, but now receiving my Master’s in less than five weeks, I can see how Advanced Practice Nurses can use innovation to create the paths we need to change the way healthcare is done today into something more holistic and increase self-reliance and caring. Great response! I agree with you Susan. As nurses we do need someone in that role. The public doesn’t really identify with nurses in the health and wellness arena. I like the recent offerings on wellness topics by ANA for CNE and now this years Nurses Week theme is Mind Body and Spirit. Perhaps we will have our own nursing leaders shine in the media and collaborate with other disciplines that are leading the way in Functional Medicine. I look forward to obtaining a holistic nurse-BC once I meet requirements. What a fantastic subject. You are correct in stating this mis-information starts in nursing school. My brother, who is in his first semester is experiencing some of this. We did some research and will be writing an article on it this week. Hopefully, as more nurses stand up and have a voice, we will change the way nursing and healthcare is managed. I foresee a change with the new generation and I welcome it. Wonderful! So great to hear of the optimistic view. And great insights into doing some research and having data to back the stand that we are taking. Thanks for coming by and sharing your thoughts on the blog. I AM A NURSE! Since 1984 I have been involved in healthcare in some manner, most recently, the last 14 years, as a Nurse Practitioner in emergency departments in Texas, Arizona, New Mexico and South Dakota. In 2012, I published a book titled “The Customer is NEVER Right: A Nurse Practitioner’s Perspective,” after seeing healthcare overtaken by, what I have coined, the EXAGGERATED UNREALISTIC EMOTIONAL EXPECTATIONS of customer satisfaction and the “perverse incentives” intended to retain customers for the purpose of profit, by any means necessary and at the cost of so much. Not only is customer satisfaction in healthcare “the elephant in the exam room” but it is our great nation’s silent national crisis as well. Which I could easily argue is the root cause of most ailments in healthcare and responsible for the overwhelming amount of collateral damage left behind. The literature, both professional and lay, is inundated with articles that stress, “Why rating your doctor is bad for your health,” yet, no one has taken heed. Rating healthcare has done nothing for healthcare but disrupt healthcare in every aspect and led healthcare in the wrong direction causing nothing but harm rather than good over the past 30+ years. What is the collateral damage I mention? -Rating healthcare undermines those with less-than-stellar scores causing those organizations to close their doors which results in decreased overall access to healthcare. Keep in mind, satisfaction surveys, of any kind (i.e. HCAPHS, Press Ganey, etc.) DO NOT focus on outcomes or the safety of healthcare workers and patients but instead focus on wait times, pain management, housekeeping, and communication skills, none of which improve the quality or cost of healthcare or are they good measures of either. -Those patients having to go elsewhere, where they overwhelm that organization, leading to deplorable circumstances and catastrophic outcomes, like increased medical errors, wait times, treatment delays and nursing workloads. -“Perverse incentives” have NOT only lead to improper opioid prescriptions, and indirectly their abuse, but those “perverse incentives” are the cause of inappropriate admissions, diagnostics, procedures and other improper prescriptions (i.e. antibiotics) as well. -Studies have shown the most satisfied patients not only spend the most on healthcare and prescriptions but they are also most likely to be admitted and most likely to die. -In 2011, the Centers for Medicare and Medicaid Services spent $226 BILLION on over-treatments that did not benefit anyone. How much of that to avoid complaints from patients? -That $226 billion wasted does not include the BILLIONS lost as a result of healthcare directed violence. A violence that has become more frequent, more brazen and more violent and those statistics skewed, as we fear losing our jobs and why negative incidents are underreported. -That $226 billion does not include the hundreds of millions WASTED on luxurious lobbies, valet services and many other accommodations intended to attract “customers”. Money wasted which keeps us from having safe nurse:patient ratios and/or healthcare workers being paid their value. The list goes on and on but those are a few of the collateral damages and the true reasons as to why so many have left healthcare rather the proposed “compassion fatigue”, as NO one fatigues from helping others. Pardon the dissertation but this topic, “the elephant in the exam room” (customer satisfaction in healthcare) and our great nation’s silent national crisis is my passion. Yet, others look away. Wow, thank you, Jose. These are great points and I appreciate you bringing this data to the discussion. And I do agree with you. We set ourselves up for burnout when we live by the slogan “The patient is always right”. While I do value patient input and participation in care, we have to realize that we cannot always put them first. We need to take care of ourselves too. Otherwise there will be no clinicians left to take care of patients! I so appreciate you coming by, reading the post, and taking the time to share from your nursing experience. Keep on doing great, great work!! I wholeheartedly agree with you! We have given nursing away to satisfaction surveys, leadership that doesn’t support nursing activities, and letting the patients decide what care they want! We are the professionals that invested a lot of time and energy into our education and we should be telling patients what we can do for them. We are not in the profession to make points with patients, but to help them manage their health. We have somehow let the patients take over and taught our novice nurses to use the convenient excuse that the patient refused this, that or the other thing! We need to teach our nurses better communication skills and engage our patients so they can make a better decision about their healthcare. It’s too easy to say to patients “do you want your medication ” or “do you want to get out of bed” and chart that they are not compliant. We need to be telling them what the plan of care is that will get them better, and engage them with appropriate choices. I am passionate about this too! This I think is the elephant in the room that keeps nurses from doing what they really are educated to do. Leadership has failed to support this aspect of professionalism and has presented and supported a service model evaluation that rates the wrong things. Can’t agree with you more, Jose! Patient satisfaction surveys are a detriment to good patient outcomes because the focus of healthcare is big business in the US, not on population wellness. The federal government has gotten it wrong (way wrong) by using HCAPHS and Press Ganey as methods for withholding reimbursement for much needed services. Leadership force feeds this service model to their nursing staff because big bucks are on the line. Add unhappy “customers” to the ever increasing tasks that RNs are continually faced with and no wonder nurses get burned out! Facilities need to understand that Family-centered care is NOT Family-directed care. This is the “elephant in the room” for bedside nurses. Leadership in most facilities have bought into the model of ‘customer service at all costs’- and it will cost them, their nursing workforce. Thanks, Gail! Glad to hear your additional insights on this topic. Appreciate the comment and keep up the great work!! I work in home health for a large health system. The agency was acquired to assist the hospital decrease length of stay and with management chronic disease to decrease re-hospitalization. We accept upwards of 600 patients per month with the capacity for 400. Many nurses hired do not have the 2 year acute care background to be successful and effective. Others could likely not maintain employment elsewhere because they are subpar with their practices; they are welcomed to a large organization that lacks accountability due to shear volume and high staff turnover. Leadership serving two masters–quality/safety or profits. My role is to educate those nurses who have missed vital information/experience. For those who cannot be informed or coach, I recommend that they seek excellence elsewhere. For the good nurses experiencing the aggregation of poor work/life balance and representation would do well to plan a nation wide walkout. We are such a responsible professional we never consider the impact of simply not showing up to do what’s treated as unimportant work. In addition, if we were a male driven profession we would have no elephant. Lastly, lack of diversity in leadership means that one perspective runs the train. A group of nurtures will rarely behave as warriors in battle. Each has their place at the table to move the needle. Nurtures will care and reason…warriors will fight until the victory is won. I like to think I am a nurturing warrior prepared to act. Thank you so much for coming by and reading the post. I appreciate you sharing your insights from your experiences. Keep up the great work! One thing I know, is that CNA’s are often very good at teamwork, they are understaffed for the amount of work they have , but I was very unhappy when my wonderful aides, who had figured out a great routine to get by best with their small crew, on getting showers knocked out, were then forbidden by the DON from doing so, So part of the elephant has to do wit administration. In fact I keep getting offered to do a “Health Administrator ” degree and I may do tat because I would like to know what are they taught that they have to be so unteamworklike and lacking team support. Great idea! Getting the degree to become part of the solution. I love this!! Thanks for sharing your thoughts on the blog. I am so glad you published this blog. If nurses ever do band together, healthcare will look very different!